I am writing to update you on my studies at Queen’s College. Yesterday was our last day of classes, and I now have four weeks off to recuperate, practice, and enjoy a (almost) white Christmas with new friends from all over the world who also can’t make it home to be with family. 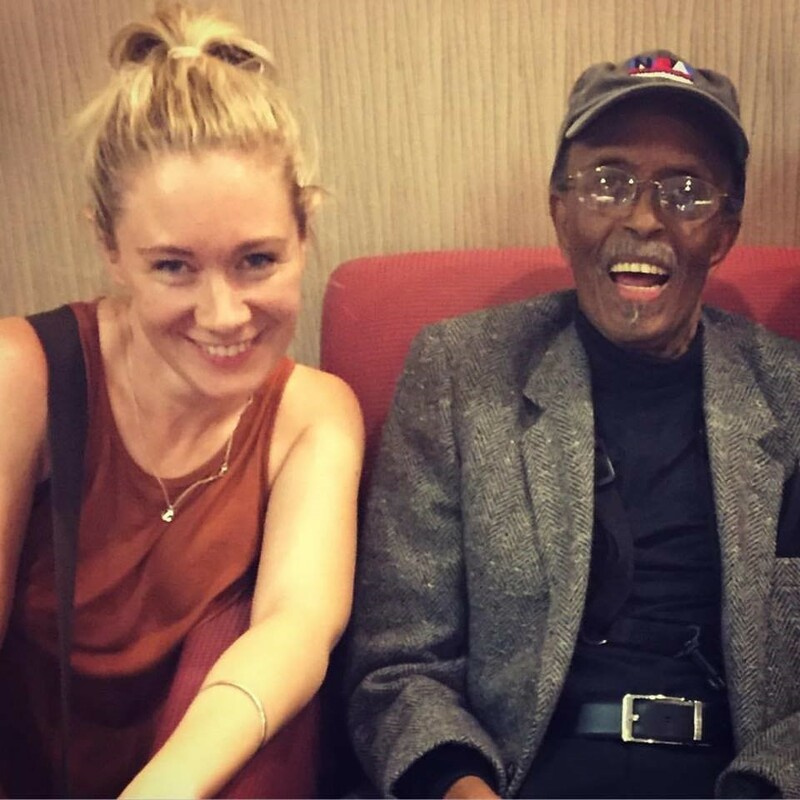 Anna having a laugh with Jimmy Heath after the concert. The course has been interesting and challenging, and having the chance to work on my musicianship full time really is the most amazing opportunity. I have been to see some of my musical heroes play live, many of whom play with the professors I am studying under. It was a thrill to often have a drink with them afterwards, and hear from them what they were currently working on. The jazz community in New York is largely a very generous one. They are keen to encourage the younger generation of musicians to keep jazz music alive. 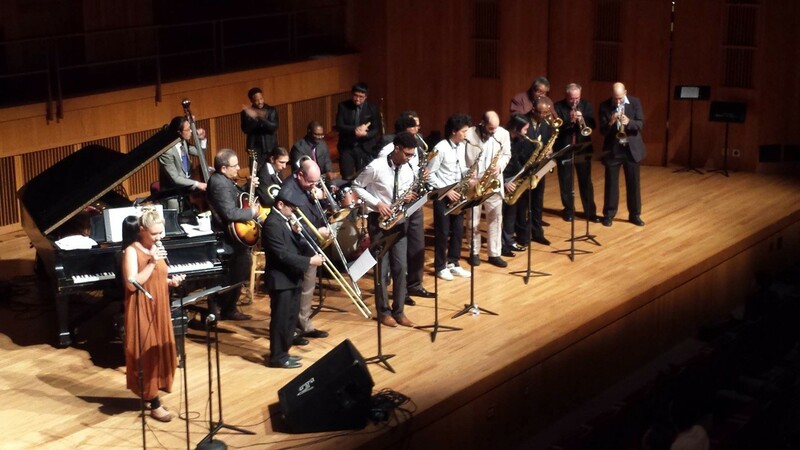 A highlight was getting to sing for Jimmy Heath on his 90th birthday, alongside my professors and fellow students. Well-known jazz singer Roberta Gamborini also jumped on stage and traded a solo with me, which was a real thrill. We had a great discussion about practice routines after the concert, with Mr Heath sharing his dedication to still practising at least two hours a day. Anna singing Jimmy Heath’s tune, “CTA” with staff members and fellow students. “CTA” is a jazz standard that has been recorded by artists including Miles Davis, John Coltrane, Chet Baker, Chick Corea, and many more. My favourite class was the vocal improvisation class, led by David Berkman, who is the author of the book I taught from as vocal tutor at Ara Music Arts. I gained so much from attending that class, as Professor Beckman is a passionate educator, and has a deep interest in how to make practice enjoyable. I have never been one to particularly enjoy practicing, however now I look forward to sitting down in a practice room, and imagine I will still feel this way when I am Mr Heath’s age. I got to sing in the ensemble that Michael Mossman takes, and composed a song the band played which was inspired by the first and only bout of homesickness I had, after the earthquake centred in Hanmer Springs – my parents’ home town. I am very grateful for the financial support of UC’s Keith Laugesen Music Scholarship and Anne Reid Memorial Trust Scholarship and of Creative New Zealand’s Aotearoa Music Scholarship. Without these Scholarships I would not be having this incredible opportunity, and I really look forward to coming back to New Zealand and sharing what I have learned with my music community back home. In case you missed it or want to see it again – check out the Orientation day | Herea tō waka welcome video. It includes information about student support services, study help and getting involved at UC. Subscribe and never miss a blog post. Where Canterbury students share their experiences.